Trump and West to speak in Florida on Saturday | can i just finish my waffle? Donald Trump will headline the South Florida Tea Party’s Tax Day Rally on Saturday in Boca Raton. 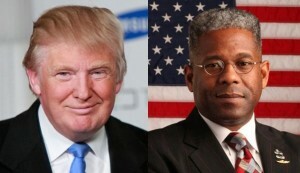 Trump will share the bill with Florida Congressman Allen West. “Our members are ecstatic,” said Everett Wilkinson of South Florida Tea Party. He explained that they had polled members on who they would most like to hear speak, and Trump was the resounding first choice. Saturday, April 16, 2011 from 1 to 3:00PM at the Sanborn Square, 72 N. Federal Highway, Boca Raton, Florida. Join thousands of patriots for the 3rd Annual Tax Day Tea Party “The Tea Party Has Just Begun” Get ready to be motivated by speakers, music and information. Posted: 04.14.11 @ 12:13 p.m.